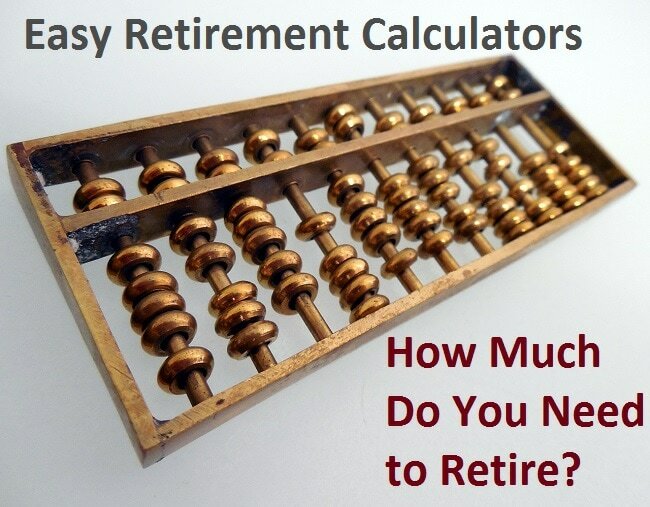 5 Useful Retirement Calculators – How Much Do You Need to Retire? A reader recently asked me if she had saved enough for retirement. While it seems like a challenging question to answer, it can be roughly calculated via online calculators providing that you have fairly accurate inputs. Some online calculators will take your expected retirement expenses as a percentage of your gross income. Many financial institutions will tell you that you need at least 80% of your income to live a comfortable retirement. However, if you run your actual expenses, you’ll likely discover that you need much less than 80% of your pre-retirement income. From my research, 50-60% of your pre-retirement income is reasonable – but only if you are retiring with no debt which I think every retiree should be going for. When I ran the numbers for our family, 55% of our pre-retirement income was enough to maintain our lifestyle during retirement. Most people have no idea what they should receive for both CPP and OAS (me included!). To get an accurate amount, you can obtain your CPP statement online. Otherwise, there are calculators that can estimate your CPP based on your career income. The first calculator below is offered by the federal government and will help provide an estimate of both CPP and OAS. If you regularly track your net worth, then you’ll have the totals of all of your assets. Most importantly, the total of your RRSP, TFSA, and non-registered accounts. You’ll need this info for pretty much any retirement income calculator. In my search for a retirement income calculator, I had a hard time finding the perfect calculator.. at least perfect for me. Each had their merits but also some serious drawbacks. In my search, this was the first retirement calculator that I came across and was actually surprised that it was created by the federal government. This calculator is pretty thorough with government benefits but lacks in some areas such as adding a spouse, non-registered assets and general taxation. The biggest weakness is for the extreme early retirement crowd, the earliest age for retirement in this calculator is age 50. I first discovered this calculator through MoneySense magazine and must admit that it has merit. I like how you can add spousal assets to get a better picture of retirement as a couple. It also uses a formula for consumption smoothing to figure out expenses. The life-cycle model was originally proposed by Yale economist Irving Fisher, roughly a century ago. At its core, the model simply says something that is patently obvious — none of us wants to splurge today and starve tomorrow or starve today and splurge tomorrow. Instead, we want to have a smooth ride when it comes to our consumption — our spending on goods and services. Consumption smoothing –trying to have a stable living standard through time, accords with our physiology. We humans quickly get satiated when we try to consume everything at once. Personally I would rather just input my own calculated expenses and move on – but to each their own. Another downside is that the earliest retirement is also 50. This calculator is what you can expect from a big bank. Very skimpy on details, but very pretty to look at. However, out of the big bank calculators that I used, I liked the BMO product the best. It was very easy to use, and allowed me to input spousal financial information. What was also refreshing was that I was able to enter any retirement age – unlike the calculators above – and my own number for my expenses. The downside is as mentioned above, very little detail in the final report and no ability to customize CPP/OAS. As a side note, CPP will likely be much lower for an extremely early retiree due a high number of low contribution years before the age of 60. This is a calculator that I discovered via a web search, and could very well be my favorite retirement calculator in this list. To start, it allows for early retirement projections (ie. earlier than age 50), and there is only one straightforward input page required before the calculations are made. Once the calculations are made, the results are very detailed with income and assets broken down by year. On the downside, there is no input field for spousal assets but you can get around this by entering family totals for the asset fields. Where other calculators allow for early redemption of CPP, this one assumes that you start at age 65. Since this calculator provides so much detail in the results, I could pick it apart more than the other calculators. For one, it assumes that you want to spend your non-registered assets first, then TFSA, then RRSP. This may not be exactly what you desire. Also, another bug is that it doesn’t account for RRIF rules where your RRSP needs to be converted to an RRIF by the age of 71 which also means forced withdrawals. And finally, a general weakness for all of these calculators is taxation. In this case, this calculator assumes that all non-registered withdrawals will be tax-free. However, in reality, the account will face taxation on dividends, capital gains, and possibly interest. My favourite of the bunch! Work out a budget of expected expenses during retirement. Don’t forget to include income taxes, albeit reduced, as an expense. Here is an example budget. This is obviously a very quick and rough calculation. If you want the down and dirty details, you can read them in my article “how much do you need to save today to retire later” and discover that you may not need as much as you think. Account for taxation of different accounts and ability to set the tax rate for each account. When you start drawing down from your RRSP for example, it will be taxable at your marginal rate. When you draw from a TFSA, withdrawals are tax-free. However, when you draw from a non-registered account, it’s tax-free when you withdraw, but you may have to sell to generate the cash to withdraw. There you have five of my favourite retirement calculators. None of them are perfect, but the product from Retirement Advisor comes the closest. Give them all a try if you can and let me know what you think. I like Retirement Advisor as well and save the data page as a PDF. Update my numbers once in a while and compare to the last PDF. When I started blogging, I calculated my number to be around $2M. Once I reach that figure, I think I can make around 5% in income for that amount. So $100K pre-taxed a year is enough for me. You should think about how much you withdraw after inflation if you plan to be retired for a long time (I hope you do :). 4% after inflation is a good rule of thumb, so you’d need $2.5M if you want to have $100,000/year pretax spending power for the long term with a low chance of running out of money. This book goes into a lot more detail of the factors and strategies to consider, it’s expensive but has a 100 page free preview http://livingoffyourmoney.com/. Thanks for the advice Greg, I really appreciate it. When I retire, I think that I will still have some sort of income that’s not coming from my savings. Three sources that I have not accounted for yet are my pension from work, CPP and real estate income. Is that $100K in today’s dollars or future dollars? In a couple decades, the cost of living will probably be about double today. I publish a spreadsheet retirement calculator on my blog at http://pabroon.blogspot.ca/2015/05/retirement-planning-and-forecasting-20.html that has all the features of your Perfect Calculator. I just started using your spreadsheet Steve, it works really well! You’ve obviously put a lot of work into this, this is the best calculator I’ve found. Your assumptions for rate of return of investments after you retire all make sense. The issue, though, is that a sustainable withdrawal rate needs to be lower in case things go wrong. Retirement can be 3 or 4 decades, so there is a lot of time for things to go wrong. The “4% Rule” is generally sound. I worked through the actual 150-year history of stocks, bonds and inflation to see what rates have been sustainable. Withdrawals of 3-4% (depending on asset allocation) have been very sound. I have found ways to get 5-6% by managing it carefully over the years. Most people should stick with withdrawals of 3-4%. That’s 3% for an income portfolio, 3.5% for a balanced portfolio (which most seniors do), and 4% for an equity portfolio. I will be writing a detailed artilce on this shortly. I’ll be interested in your planned article. Some things I’d be interested in seeing addressed in it: How did you go through the 150 year history stocks? And what income harvesting (eg. rebalancing) and withdrawal strategies (eg. fixed rate inflation-adjusted or fixed percentage) did you consider? It would be hard to beat the analysis Michael McClung does in http://livingoffyourmoney.com/. Are you familiar with this? I’d be interested to know what you think of it. The book provides strong evidence that the highest safe withdrawal rates come from balanced portfolios, too much equity (more than 60%) and you run the risk of having to sell stocks when the are down which leads to a death spiral to running out of money. The book also provides strong evidence that though you can usually afford to withdraw 5-6%, putting a 5% floor on your withdrawal rate is pretty risky. The calculators start at 50…..I wish. MDJ is compulsive reading in order for me to be on target to retire at 65. My bad but thanks for the excellent information FT and all you commentators. ESPlanner basic calculator is now also unavailable. Looks like they are dropping off like flies! I will have to look around for additional calculators.